© 2018 Brandão P, et al. This is an open-access article distributed under the terms of the Creative Commons Attribution License, which permits unrestricted use, distribution, and reproduction in any medium, provided the original author and source are credited. Polymorphic Eruption of Pregnancy, also known as Pruritic Urticarial Papules and Plaques of Pregnancy, is a common benign dermatosis of pregnancy related to stretching of the abdominal wall, frequent misdiagnosed with an allergic reaction. It usually appears during late third trimester and resolves within few days or weeks or after deliver. 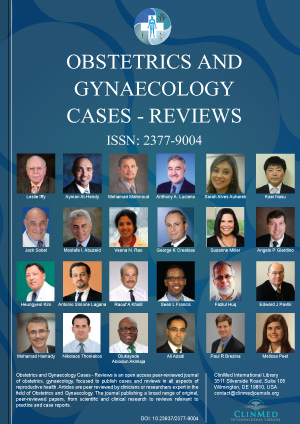 The authors present a case of Polymorphic Eruption of Pregnancy with its typical features appearing for the first time 5 days after delivery. The patient had an acute broad highly pruritic rash with coalescent papules and plaques affecting the abdominal wall, proximal arms and tights. One week after topical steroid treatment the patient had evident recovery both in pruritus and cutaneous lesions. Pedro Brandão, Department of Obstetrics and Gynaecology, Centro Hospitalar Tâmega e Sousa, Av. Hospital Padre Américo 210, 4564-136 Penafiel, Porto, Portugal, Tel: (+351)-255741000.